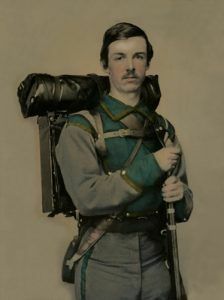 Unidentified Confederate soldier, by Charles Rees, 1861. The second state to declare secession from the Union, on January 9, 1861, Mississippi joined with six other states the next month to form the Confederate States of America. Long a hotbed of secession and states’ rights, Mississippi proclaimed: “Our position is thoroughly identified with the institution of slavery–the greatest material interest of the world.” With South Carolina, Mississippi was one of only two states in the Union in 1860 where the majority of the population were slaves. Its location on the Mississippi River made it strategically important to both the Union and the Confederacy, resulting in dozens of battles as troops repeatedly clashed near Mississippi’s key towns and cities, such as Corinth, Jackson, Natchez, and Vicksburg. Although there were small pockets of citizens who remained sympathetic to the Union, the vast majority of Mississippians embraced the Confederate cause, and thousands flocked to the military. About 80,000 white men from Mississippi fought in the Confederate Army and some 500 white Mississippians fought for the Union. Soldiers from the Magnolia State fought in every major theater of the war, although most were concentrated in the Western Theater. As the war progressed, a considerable number of freed or escaped slaves joined the United States Colored Troops and similar black regiments, including more than 17,000 black Mississippi soldiers fighting for the Union. Also called the “Mississippi River Campaign” and the “Fort Henry and Fort Donelson Campaign,” this force by the Union began on February 6, 1862 as a strategy to allow the North invasion routes by land and by water, as well as cutting of supplies to Confederate Forces. General Ulysses S. Grant moved his troops swiftly down the Tennessee River toward Fort Henry on river transports on February 2nd and coordinating with United States Navy Flag Officer Andrew H. Foote, the campaign ended with the Siege of Corinth, Mississippi in June, 1862. Siege of Corinth (April 29-May 30, 1862) – Also called the First Battle of Corinth, this was the fourth and last conflict of the Cumberland and Tennessee Rivers Campaign. After the Fort Henry, Fort Donelson, and Shiloh battles in Tennessee, Union troops continued south to Corinth, Mississippi. 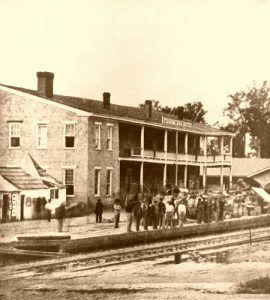 Under the command of Major General Henry W. Halleck — the Army of the Tennessee, the Army of the Ohio, and the Army of the Mississippi — advanced on the vital rail center of Corinth. Cautious due to the staggering losses at Shiloh, Halleck approached very slowly, fortifying his troops after each advance. By May 25, 1862, after moving five miles in three weeks, he and his troops were finally in a position to lay siege to the town. However, Confederate General P.G.T. Beauregard, aware of the impending attack, made other plans. As the Union forces maneuvered for position, the Confederate Army moved out during the night of May 29, 1862, though they pretended to be preparing for an attack.